Price fixing goes against everything the so-called “free market” stands for. And it’s illegal. Even so, collusion plagues numerous industries. And the PC hardware industry is no different. PC hardware prices fell for a long time. As new, state-of-the-art of technology arrives on the market, older hardware falls in price. Or, at least it did. Now, unless you source second-hand technology, there is a premium attached to almost every piece of hardware. But the issue goes much further than that. There is a growing body of evidence heavily suggesting that there is widespread price collusion between several major hardware manufacturers. Let’s look at the evidence and find out if price fixing is rife throughout the industry. We’re going to focus on the price of DRAM How Is RAM Made, And Why Does The Price Fluctuate? How Is RAM Made, And Why Does The Price Fluctuate? Random Access Memory, more frequently known as RAM, is a common component that every PC needs. Read More . Toward the end of the article, we’ll briefly look at some other PC hardware examples. The price of DRAM is rising and has done since early 2010. Using PCPartPicker 3 Simple Ways to Save Money When Building a New Computer 3 Simple Ways to Save Money When Building a New Computer There are a few tips and tricks you should know to save even more money when building a PC. Read More , we can see that during the past 18 months, the average price of a DDR3-1866 2x8GB kit has risen from under $70 to over $140. 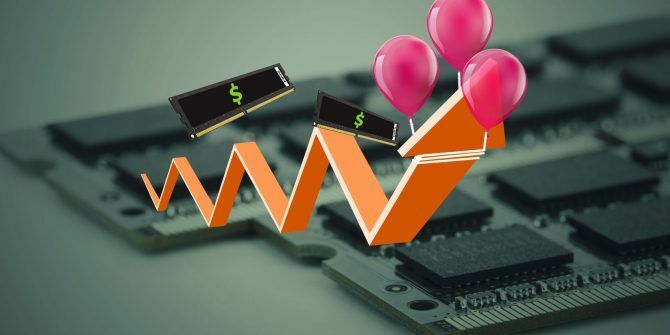 During the same period, the average price of a DDR4-2400 4x4GB has more than doubled, from under $90 to over $180 — a substantial increase for consumers and businesses alike. This triple combination translates to higher DRAM prices. Let’s examine the points in turn. There are three major DRAM manufacturers. Samsung, Hynix, and Micron account for 94.5% of the entire DRAM market. Regarding physical production, if any of these manufacturers experience a poor quarter or two, global production suffers. If more than one manufacturer suffers multiple poor quarters, the result can affect DRAM availability worldwide for at least half a year, and probably more. Many expected production to rise toward the end of this year and throughout the traditionally quiet period beginning each year. Both Samsung and Micron are transitioning to new, smaller manufacturing processes. However, DRAMeXchange, a TrendForce division, report that “both Samsung and Micron have encountered setbacks related to sampling and yield” regarding new fabrication processes. This directly impacts global supply. The only major manufacturer that isn’t transitioning to a new manufacturing process is Hynix. And part of the same DRAMeXchange report explains that they simply cannot expand production due to aging facilities and their existing contractual orders for DRAM. Concurrent to a global dip in DRAM production, demand is increasing. The latest and greatest generation of smartphone technology primarily uses DDR4 RAM. In addition, global smartphone production continues to rise, jumping from 1.359 billion in 2016 to a predicted 1.459 in 2017. Chinese smartphone manufacturers alone will account for some 629 million units. But it isn’t only smartphone manufacturing that has a direct influence on DRAM prices. 2017 is a great year for new PC hardware, particularly CPUs. Intel announced a new generation of powerful CPUs Intel Core i9 vs. i7 vs. i5: Which CPU Should You Buy? Intel Core i9 vs. i7 vs. i5: Which CPU Should You Buy? Intel and AMD are back in a battle of processors, with Intel's Core i9 as the fastest consumer desktop processor ever. Read More , while AMD released their extremely competitive Ryzen CPU line What Is So Good About the New AMD Ryzen? What Is So Good About the New AMD Ryzen? The AMD Ryzen just landed, and the world of CPUs just got interesting. What is the hype all about, and is it right for you? Read More , featuring the beasty Threadripper (read our Threadripper review A Short Guide to the Fantastic AMD Threadripper CPU A Short Guide to the Fantastic AMD Threadripper CPU AMD was in the CPU wilderness for several years, but is back with a massive bang. The AMD Threadripper is one the most powerful consumer CPUs on the market, but is it right for you? Read More ). Consumers are ditching their old hardware and upgrading to new CPUs, likely upgrading their DRAM in the process. Also, server sales continue to increase, sometimes requiring DRAM in staggering quantities. Think about how many servers Google owns. They have terabytes of DRAM spread around the world. And while they are not the only company — nay, industry — that requires such a vast amount of DRAM, powering the entire world’s search requires an incredible amount. The two reasons for price rises laid out above are perfectly reasonable. Annoying in parts for consumers like you and I, but plausible, nonetheless. However, in 2002, the U.S. Department of Justice (DOJ) began an extensive probe into DRAM manufacturers, under the Sherman Antitrust Act. The DOJ found that five major DRAM manufacturers were colluding as part of an international DRAM price-fixing conspiracy. The manufacturers — Hynix, Infineon, Micron Technology, Samsung, and Elpida — pleaded guilty, all receiving fines. These companies do collude together. In fact, accusations of collusion are fairly common. At present, production for all three major DRAM manufacturers is slow, causing global shortages, their profits continue rising. Avril Wu notes that “a large price increase in the PC DRAM market that is not caused by a factory accident disrupting the supply is rare,” adding that “the recent DRAM price upswing reflects the oligopoly.” As the three major manufacturers all-but have the market completely sewn up, it is in their best interest to co-exist, rather than to aggressively pursue market share through innovation, capacity expansion, and price-cutting. Furthermore, continued protectionism of the DRAM market by the major manufacturers decreases the chance of China breaking the dominant hegemony. During the slight downturn in DRAM prices during 2016, Chinese semiconductor companies attempted to acquire stalling memory manufacturers, but were almost entirely rebuffed. The presence of Chinese government-backed memory manufacturing businesses is extremely worrying for the incumbent manufacturers. This is worrying for a number of reasons, not least the overwhelming government support and extensive funding for Chinese exports. The pendulum swings both ways. Yes, there is collusion in one sense. The major manufacturers are loath to lose their DRAM market dominance, along with the financial hit that would surely accompany any serious threat from a new major manufacturer. China has created two enormous advanced memory manufacturing parks in the cities of Wuhan and Nanjing, valued at an estimated $54 billion. (That said, Lee Pei-Ing, president of Nanya Tech, the fourth largest DRAM manufacturer, believes it will take at least three to five years before Chinese DRAM positively affects the market through price drops and additional supply capacity.) But the Chinese government’s desire to be entirely self-sufficient for all technology products is evident. Conversely, the substantial uptick in devices requiring the latest DRAM fabrications, as well as untimely manufacturing switches from traditional PC RAM to NAND flash storage A Quick & Dirty Guide to RAM: What You Need to Know A Quick & Dirty Guide to RAM: What You Need to Know RAM is a crucial component of every computer, but it can be confusing to understand if you aren't a tech guru. In this post, we break it down in easy-to-grasp terms. Read More has created the worst scenario possible for consumers. So while there undoubtedly has been collusion, proving it in its entirety is incredibly difficult. As I said, PC hardware price collusion isn’t new news. There are numerous instances throughout recent history where elite manufacturers have conspired to create artificial stock shortages, hold prices at certain profit levels, and more. Here are two recent examples. In 2008, AMD and Nvidia faced accusations of price fixing and taken to court in a class action lawsuit. The class action alleged that the two manufacturers “conspired to fix, raise, maintain and stabilize prices of GPUs sold in the United States.” The graphics card giants were never directly found guilty in court. However, they settled out of the courtroom for a significant figure. As of 2017, the same GPU manufacturers dominate the market. In 2012, the FBI confirmed a conspiracy to fix the prices of LCD panels. Amongst other conspirators, AU Optronics Corporation was ordered to pay a $500 million criminal fine, with two former executives receiving three years in federal prison. Can You Avoid High Hardware Prices? Unfortunately, if you’re just about to build a new PC, buy a new server, or even just upgrade to some faster RAM, you’re out of luck. Prices aren’t predicted to fall until at least mid-2018 when Samsung and Micron begin to increase production capacity. And even then, it could take until 2019 to see any true prices drops as those manufacturers complete their contractual obligations before ramping up production for everyday consumers. At the current time, waiting for a deal is the best bet When's the Best Time to Buy & Sell Electronic Devices? When's the Best Time to Buy & Sell Electronic Devices? Knowing when to buy and sell electronics can save you hundreds of dollars. Here's how to time your purchases and sales to make the most of annual buying cycles. Read More . The vast sales of Black Friday and Cyber Monday Black Friday and Cyber Monday: A Gamer’s Complete Guide Black Friday and Cyber Monday: A Gamer’s Complete Guide Gamers can get huge sales on Black Friday and Cyber Monday! Heed these tips to get the best deals on games, consoles, and PCs. Read More are on the horizon and usually throw up a deal or three (as well as a few scams to be aware of 7 Scams to Watch Out for on Black Friday and Cyber Monday 7 Scams to Watch Out for on Black Friday and Cyber Monday While you shop for deals this Black Friday and Cyber Monday, scammers will be looking for YOU. Here's how to shop safely online. Read More ). Furthermore, there are traditional sales in the post-Christmas haze, but PC hardware prices are generally unaffected by this (though there are usually one or two decent deals to be found!). But there are other factors to consider, too. The cryptocurrency mining boom has seen the price of new GPUs skyrocket With GPUs Skyrocketing in Price, Should You Buy a Graphics Card? With GPUs Skyrocketing in Price, Should You Buy a Graphics Card? Because of cryptocurrency mining popularity, the demand for graphics cards (GPUs) skyrocketed. Find out if you should buy a graphics card or not, and what the best alternatives are! Read More (and in fact, some consider these demand-based price increases as a form of price gouging, another issue facing consumers). You’ll have to be careful with your purchasing decisions. Uncovering and fighting against major manufacturers rigging the market is extremely difficult. But eventually, evidence arises, the public finds out, and investigators move to break up unfair practices. But, as we’ve seen, even that doesn’t stop the issue at hand. Have high DRAM prices hurt you? How about other PC hardware? What should regulators do to stop illegal price increases in RAM? Let us know your thoughts below! So only China can stop this lobby? I've never seen packaged ram of any kind being sold for anything close to $180. I think you could have shortened the article to just this. I think we learned about this school but I recall it being called supply and demand. But I suppose collusion makes for better headlines. If the companies are agreeing/conspiring to artificially raise prices, it's collusion and it's illegal. We have anti-monopoly laws for a reason.